"A nuclear power plant in Fukumi, Japan exploded at 4.30AM today. If it rains tomorrow or later, don't go outside. If you are outside, be sure that you have rain protectors. It's acid rain. Don't let it touch you. You may burn your skin, lose your hair or have cancer. Please pass, stay safe and remind everyone you know." ".BBC FLASHNEWS: japan govt cnfirms radiation leak at fukushima nuclear plants. Asian countries should take necessary precautions. Remain indoors first24hrs. Close doors n windows. Swab neck skin with betadine where thyroid area is, radiation hits thyroid first. Take extra precaution, radiation may hit phil at startng 4pm 2day"
If you did receive the SMS about the radiation leak at Fukushima (Japan), please know that it is a hoax. This has been further confirmed by Philippine Nuclear Research Institute (PNRI) and the Philippine Atmospheric, Geophysical & Astronomical Service Administration (Pagasa). MANILA, Philippines – (UPDATE 2) Government officials stamped down fears of acid rain and nuclear clouds resulting from a leak from one of the nuclear plants in Japan following an 8.9-magnitude earthquake last week. The Philippine Nuclear Research Institute (PNRI) and the Philippine Atmospheric, Geophysical and Astronomical Services Administration (PAGASA), sought to allay the public's fears as warnings of radioactive clouds and acid rains circulated through text messages. 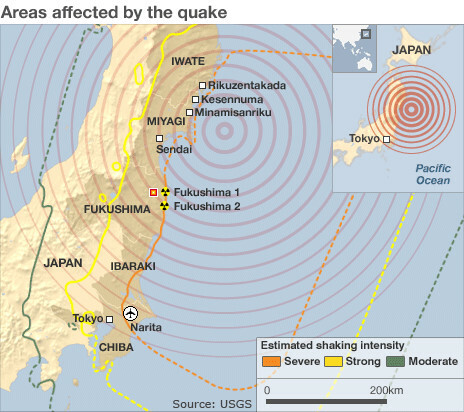 The PNRI said it had been conducting tests of the air since the first explosion at the Fukushima power station on Saturday, a day after a deadly quake and tsunami struck Japan. "Based on (our) monitoring, there has been no increase in the levels of radioactivity since the time of the Fukushima event," the agency said in an emergency response bulletin Monday. The bulletin came hours after a second explosion at the Fukushima plant. The PNRI also allayed fears of radiation clouds coming over to the Philippines. And should there be one, "the plume from the site of the incident will not pass Philippine territory as of March 14," PNRI said. “It does not make sense,” said weather forecaster Raymond Ordinario when asked to react to text messages warning the public of possible contaminated rainfall caused by radiation emitted from a leak inside the Fukushima plant. “It does not make sense because the location of the explosion is too far, so it does not affect our local rainfall,” Ordinario told INQUIRER.net. In another press briefing on Monday afternoon, attended by President Aquino, Health Secretary Enrique Ona stressed that the public need not panic about suffering from radiation exposure resulting from the damages to a Fukushima nuclear power plant in Japan. "The Philippines is safe from radiation," Ona said. Also present in the briefing were Executive Secretary Paquito Ochoa Jr., Science and Technology Secretary Mario Montejo, Budget and Management Secretary Florencio Abad, Presidential Spokesman Edwin Lacierda, Presidential Communications Development Office Secretary Ricky Carandang, and officials of PNRI, PAGASA and the National Security Agency. Ona said that as of 11 a.m., "the wind pattern in Japan showed that the Philippines is unlikely to be hit by any radioactive fallout from Fukushima." He said PNRI coordinates with the International Atomic Energy Administration to gather updates on the status of the Fukushima nuclear power plant incident. Ona assured the public that his, department along with other government agencies, are monitoring the situation on an hourly basis and have contingency measures planned. Ordinario denied this saying that what the message described was possible effects of acid rain. He said that acid rain is formed when gaseous substances like sulphur and nitrogen mix and react with water in the clouds. Ordinario said that radioactive materials were in metal form so it would not react with water. Here’s another text message that has been spreading, allegedly from BBC: “Japan govt confirms radiation leak at Fukushima nuclear plants. Asian countries should take necessary precautions. Remain indoors first 24hrs. Close doors n windows. Swab neck skin with betadine where thyroid area is, radiation hits thyroid first. Take extra precaution, radiation may hit Phil at starting 4pm 2day. Pls send to ur loved ones." The Agence France Presse reported that United Nations atomic watchdog International Atomic Energy Agency has declared the radiation levels from the Fukushima nuclear power plant normal. "Radiation dose rate measurements observed at four locations around the plant's perimeter over a 16-hour period on 13 March were all normal," the IAEA said in a statement. Likewise, Pagasa forecaster Robert Sawi said the winds from Japan would not travel to the country. As of Monday, it has been moving west to east, which meant it has been traveling from Japan to the Pacific Ocean, he said. “Kung sino man nagpapakalat nito, baka nananakot lang [Whoever is spreading this is probably just scaring people],” Ordinario said. Therefore guys, do not worry about acid rain although Fukushima Nuclear Power Plant Exploded. You are still safe. 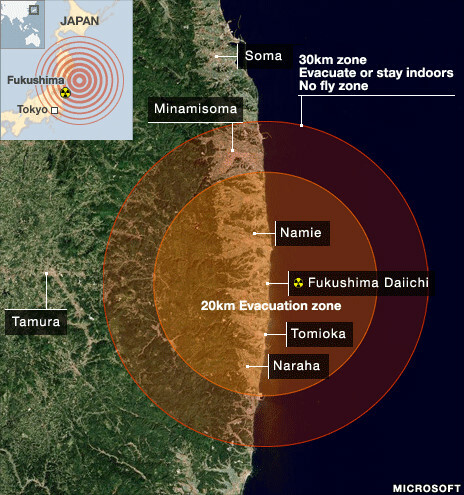 You can read latest news about current situation of Fukushima Nuclear Plant @ BBC News [UK]. "Ini pada diri saya adalah satu pengajaran kepada negara-negara lain. Ia akibat kelalaian pembangunan mesra alam. Mereka harus mengkaji dulu keadaan sekeliling dan mengaitkan climate change dan green technology. Termasuk juga negara kita"
There has been so many people dislike this video especially her insensitive comment. Anyway, there is something we can do to help Tokyo goes through all this. 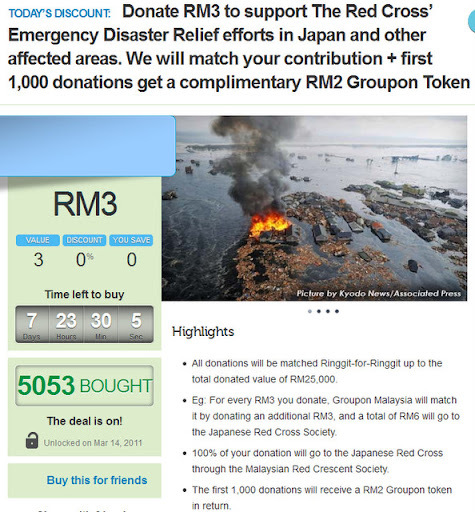 Groupon Malaysia is now having a donate RM3 to support The Red Cross Emergency Disaster Relief efforts in Japan and other affected areas. Groupon Malaysia will match your contribution + first 1,000 donations get a complimentary RM2 Groupon Token. 100% of your donation will go to the Japanese Red Cross through the Malaysian Red Crescent Society. More details @ this page. Now I just hope that the hoax won't become a truth. Will keep this site updated!